Ambassador David Friedman says VP Pence's 'historic' speech in Knesset moved him to tears. 'An extraordinary address'. Vice President Mike Pence’s address to the Knesset Monday afternoon, the first by a senior American official in a decade, was praised by a number of Israeli officials from across the political spectrum, who noted the Vice President’s pledge to bar Iran from obtaining nuclear weapons and a time-table for the relocation of the US embassy from Tel Aviv to Jerusalem. 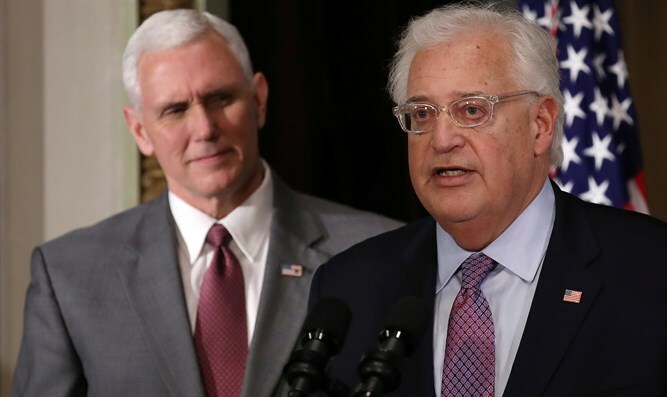 US Ambassador to Israel David Friedman, however, expressed a more personal reaction to the speech, saying that he had been so touched by it as to have been moved to tears. In a tweet posted a few hours after the address Monday, Friedman called Pence’s speech “extraordinary”. During his address, Pence hailed the US-Israel alliance, and pointed to the cultural ties between the US and the Jewish state. "In the story of Jews, we have always seen the story of America. Our founders turned to the Hebrew Bible for direction," Pence said. "Tomorrow, when I stand at Yad Vashem, we will marvel at the faith and resilience of your people, who rose up from the ashes to resurrect yourselves and rebuild the Jewish state." "Seventy years ago, the US was the first to recognize Israel, but since then, one administration after another refused to recognize its capital. Last month, US President Donald Trump righted an historical wrong when he declared Jerusalem as Israel’s capital. "Israel’s bond to Jerusalem stretches back 3,000 years. Jerusalem is Israel’s capital, and as such, Trump as ordered the state department to immediately move the embassy from Tel Aviv to Jerusalem. The embassy will open before the end of next year. "We will believe the President’s decision is in the interest of peace. By recognizing Jerusalem, Trump has chosen fact over fiction. In decision on Jerusalem, Trump called all parties to maintain status quo, and made clear we’re not taking position on final status issues. If both sides agree, US will support a two state solution. "Peace can only come through dialogue."